What Is Resin Treated Polyester? With all the natural and synthetic fabric types in existence, understanding what composes a specific fabric often proves difficult. Knowing about fabric treatments further complicates matters. Resin refers to a natural substance commonly used to treat polyester, which is a synthetic fabric. Polyester fabric refers to a type of synthetic polymer fiber made from a combination of coal, petroleum and water. Polyester fabrics resist wrinkling and remain strong throughout wear and general use. In spite of its durability, polyester feels soft and dyes well, but also stains easily. Resin refers to a yellow-brown tree secretion soluble in ether, essential oils and alcohol. It does not dissolve in water. Carbon, hydrogen and oxygen make up this viscous substance, and while resins occur in nature, they may also be prepared through the synthetic polymerization of simple molecules. While polyester dries quicker than many natural fabrics, applying a resin finish to polyester fabric makes the resin-treated areas water repellent. Resin also gives polyester a smooth, shiny appearance. Examples of polyester fabrics often treated with resin include swimwear, fiber batting, pillow cases and seat cushions. 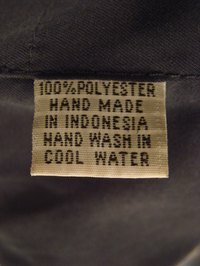 What Is Polyester Fabric Made From?